The media war with the West was lost the day the Syrian uprising began, President Assad told a Russian broadcaster. The authorities appear ready to start another round by showing to the world the foreign mercenaries captured in Syria. A number of key questions have arisen since Assad gave his last interview over half a year ago. Assad answered them all in a new interview with Rossiya-24 TV channel. Assad admits that Syria is losing the media war against the West, but says “the reality is what really matters” and not “the illusions” created by the media. He said that the media outplayed the Syrian government in the very beginning of the conflict by making up stories and spreading rumors. But in the long term the media cannot beat the reality, he added, and eventually the circumstances have changed because what is really happening is very much different from what the media reports. Assad also said that the Syrian government repeatedly tried to express its point of view to numerous international journalists, but the agencies kept sending to Syria only those people who would stick with the same lies and false picture created in the first days of the conflict. Assad says that the Syrian National Council, an “opposition” operating from abroad, has from little or no influence on what is happening in Syria and does not have any kind of significance within Syria. Though on the ground the Free Syrian Army is widely considered to be the core of the armed and organized opposition movement, Assad believes the FSA has not much to either with freedom or the organized army. “First of all they are not free,” the head of state said, explaining that they will never be free while they are supplied with guns and funded from abroad. He described the Free Syrian Army as a crowd of convicted criminals, comprised among other things of Al-Qaeda type religious fanatics, extremists and terrorists and to some extent of foreign mercenaries, predominantly from other Arab states. Assad revealed that Syrian forces had captured a number of foreign mercenaries who were fighting for the opposition. He explained the authorities had not advertised the fact until now because they did not have enough evidence to prove the fighters were indeed mercenaries. “Some [of the mercenaries] are still alive,” he said. “They are being detained and we are preparing to show them to the world. Many of them have been killed.” Syrian rebels are also known to have gone to Kosovo to study partisan warfare tactics, Assad added. “There is information that a group of people who call themselves opposition went to Kosovo to train in organizing military intervention by NATO into Syria,” he told Rossiya-24. President Assad believes that what Russia and China, who repeatedly expressed their support for Syria and backed the country in the UN Security Council, are in fact supporting is neither the regime (Assad prefers the expression “form of government”) nor Assad as the head of state, but international stability. Both Russia and China have a good grip on the geopolitical situation in the region and they understand that without their support not only Syria but a lot of its neighbors will plunge into chaos, Assad explained. 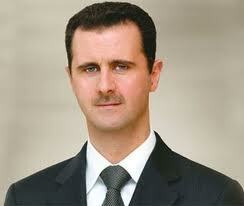 “It is not a question of Syria, it is a question of international stability,” Assad said.